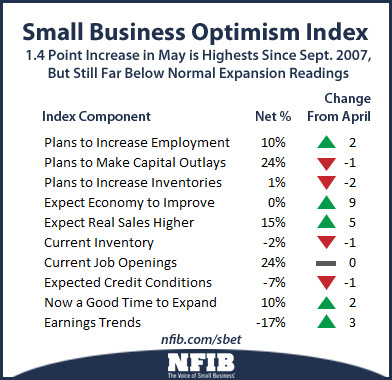 WASHINGTON – NFIB Optimism Index rose 1.4 points in May to 96.6, the highest reading since September 2007. However, while May is the third up month in a row, the Index is still far below readings that have normally accompanied an expansion and there have been similar gains in the past that haven’t panned out in this recovery period. Five Index components improved, one was unchanged and four fell, although not by much. • Labor Markets. NFIB owners increased employment by an average of 0.11 workers per firm in May (seasonally adjusted), the eighth positive month in a row and the best string of gains since 2006. Seasonally adjusted, 11 percent of the owners (down 2 points) reported adding an average of 3.0 workers per firm over the past few months. The remaining 77 percent of owners made no net change in employment. Fifty-five percent of the owners hired or tried to hire in the last three months and 46 percent reported few or no qualified applicants for open positions. GDP declined in the first quarter, so one would expect reduced labor demand. This did not occur. Twenty-four percent of all owners reported job openings they could not fill in the current period (unchanged), providing some downward pressure on the unemployment rate. Fourteen percent reported using temporary workers, unchanged for several months. Job creation plans continued to strengthen and rose 2 percentage points to a seasonally adjusted net 10 percent, approaching “normal” levels for a growing economy, even with no growth last quarter. • Sales. The net percent of all owners (seasonally adjusted) reporting higher nominal sales in the past 3 months compared to the prior 3 months improved 1 point to a net negative 1 percent, far better than the negative 34 percent readings in 2009. This is the best seasonally adjusted reading since early 2012 when the economy temporarily reached a more normal growth path. Twelve percent cite weak sales as their top business problem, the best reading since December 2007, the peak of the expansion. Expected real sales volumes posted a 5 point rising to a net 15 percent of owners, the best reading since mid-2007. Expectations for improved sales volumes have strengthened substantially, but this has not translated into strong demand for inventories or employees. • Earnings and Wages. Earnings trends improved 3 points to a net negative 17 percent., Rising labor costs are keeping pressure on earnings, but there appears to be steady improvement in profit trends. This is one of the best readings since mid-2007 with the exception of a few months in early 2012 when the economy made an attempt to pick up the pace of economic growth. Three percent reported reduced worker compensation and 24 percent reported raising compensation, yielding a seasonally adjusted net 20 percent reporting higher worker compensation, unchanged and among the best readings since 2008. A net seasonally adjusted 15 percent plan to raise compensation in the coming months (up 1 point), the strongest reading since 2008. The reported gains in compensation are now solidly in the range typical of an economy with solid growth. Although GDP growth in Q1 was negative, the small business sector continues to show signs of progress, small as they may be. • Credit Markets. Five percent of the owners reported that all their credit needs were not met, unchanged and 1 point over the record low. Thirty percent reported all credit needs met, and 53 percent explicitly said they did not want a loan. Only 3 percent reported that financing was their top business problem compared to 25 percent citing taxes, 20 percent citing regulations and red tape and 12 percent citing weak sales. Owners remain more concerned about taxes, regulations and health insurance costs. • Inventories. The pace of inventory reduction was steady, with a net negative 4 percent of all owners reporting growth in inventories (seasonally adjusted) a more positive overall reading by 2 points. Unadjusted, 14 percent reported an increase in inventory stocks (up 2 points) and 14 percent reported inventory reductions (down 3 points). Reductions are good if in response to strong sales, but not so good if it is in response to weak sales. Overall, the sales picture has improved, albeit not strongly. The net percent of owners viewing current inventory stocks as “too low” lost 1 point, falling to a net negative 2 percent, historically still a “lean” reading. Sales trends did improve, although remained historically weak. The solid reading for expected real sales contributed to a need to rebuild but the net percent of owners planning to add to inventory stocks fell 2 points to a net 1 percent. While inventories have been building solidly at the national level, it appears that the small business sector is adding only a little to the accumulation of stocks reported in the GDP accounts. • Inflation. Eight percent of the NFIB owners reported reducing their average selling prices in the past 3 months (down 2 points) and 21 percent reported price increases (down 3 points). Seasonally adjusted, the net percent of owners raising selling prices was a net 12 percent, unchanged from April after an 8 point rise in March. Twenty-two percent plan on raising average prices in the next few months (down 3 points) and only 2 percent plan reductions (down 1 point), far fewer than actually reported reductions in past prices. Seasonally adjusted, a net 21 percent plan price hikes (down 1 point). If successful, the economy will see a bit more “inflation” as the price indices seem to be suggesting. Today’s report is based on the responses of 678 randomly sampled small businesses in NFIB’s membership, surveyed throughout the month of May. Download the complete study at http://www.nfib.com/sbetindex. *All net percentages seasonally adjusted unless otherwise noted. The net percentage is the percent with a favorable response less the percent of owners with an unfavorable response. NFIB is the nation’s leading small business advocacy association, with offices in Washington, D.C. and all 50 state capitals. Founded in 1943 to give small-business owners a voice in public policy-making, NFIB’s policy positions are set by its 350,000 business-owner members, who send their views directly to state and federal lawmakers through NFIB’s unique member-only ballot. NFIB’s mission is to promote and protect the right of our members to own, operate and grow their businesses. More information is available online at www.NFIB.com/news.